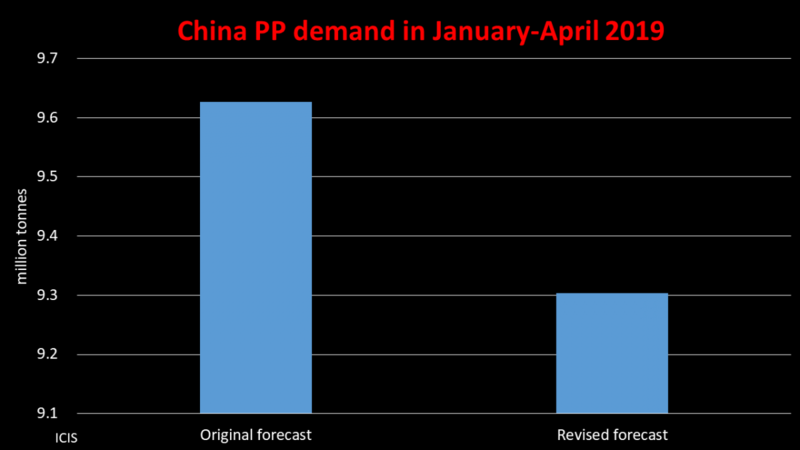 WE ALREADY know that forecasting Chinese polyethylene (PE) demand growth based on multiples of GDP doesn’t work. This is almost certainly the case with all the other polymers. As discussed last week, the problem starts with the forecasts for GDP growth. They will be inflated for political reasons. A new Brookings Institution study shows that in 2008-2016, official actual GDP growth rates – which were very close to the official estimates – were 1.7 percentage points too high per year. What makes the top down approach of multiples over GDP even more flawed is that it usually involves one number only for the whole of China, when, instead what’s needed are different forecasts that reflect China’ s sub-national economies. You wouldn’t have one demand number for the whole of the EU, would you, when say Germany is a very different economy than Italy. So why just one number for China? There are the booming coastal provinces, the northeast rust best facing downward pressure from the shutdown of oversupplied industrial capacity, rapidly growing “middle” China and the very poor far west. Ok then, another methodology is needed. 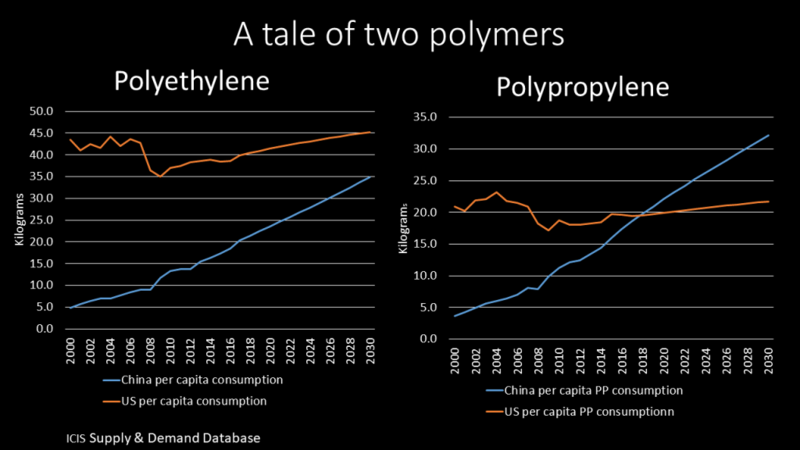 What about per capita polymers consumption? I think this has value but as a sole measure of growth it has major weaknesses. 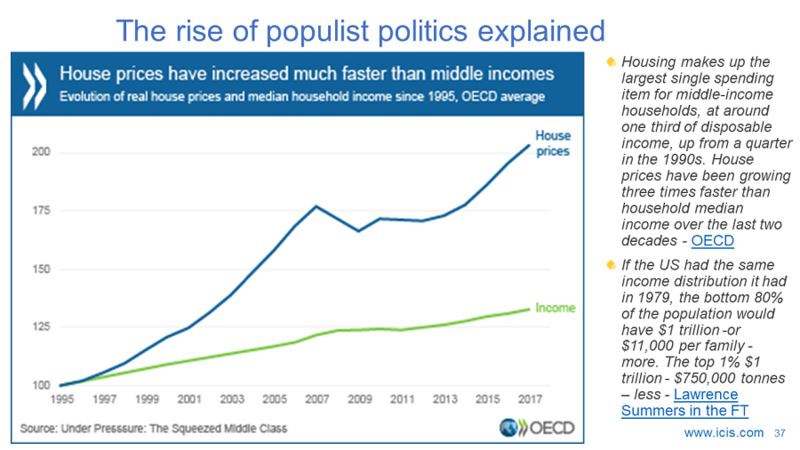 The chart on the left at the beginning of this blog post shows how average PE per capita consumption in China remained way behind the US up until 2018. You would expect this as the average per capita income in the US in 2018 was $53,820 compared with China’s $9,636. 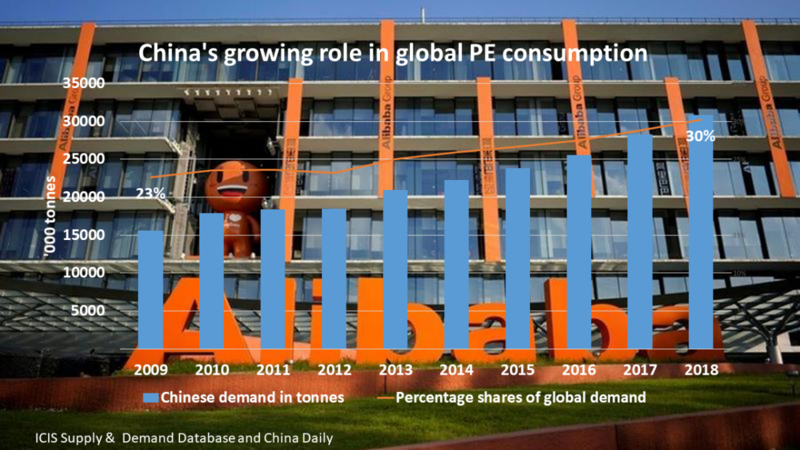 In China, there are big regional variations of PE per capita consumption. As my chart last week showed, in 2017 people in Beijing, China’s richest administrative region, consumed 46 kilograms per person. In Gansu, though, China’s poorest region, consumption was just 10 kilograms. This reflects the fact that despite China’s fantastic economic growth since 1978, it remains a very poor country relative to the US and the remainder of the developed world. Hence the need to treat China as effectively several different economies in order to gauge the potential for further growth. And even up until as late as 2030 our base case shows the US remaining ahead of China, although the gap will continue to close. 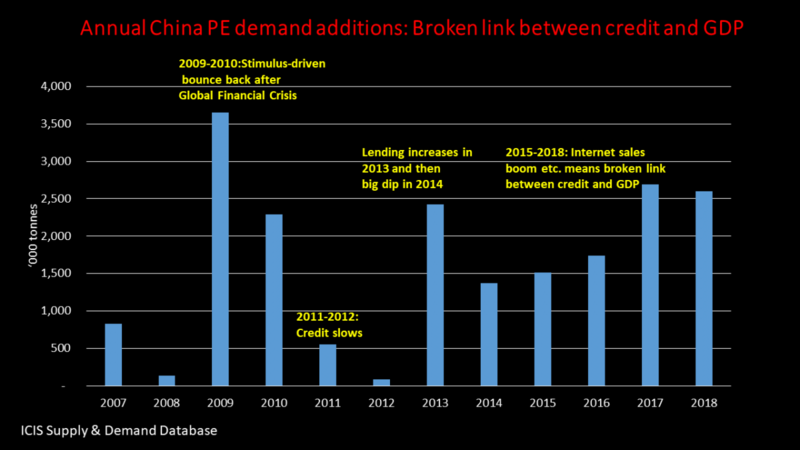 Back in 2000, China’s per capita PE consumption was just 11% of the US but we expect this to reach 55% in 2019. We think it will reach 77% in 2030. In 2000, China’s per capita consumption of PP was just 17% of the US level. Last year, though, China per person consumption edged above the US for the first time. We forecast that by 2030, China will be 148% of the US level. So, what’s going on here? The explanation has to do with the different end-uses of the polymers, I think. Whereas PE is predominantly used for wrapping daily necessities such as food, a significant percentage of PP goes into durable items such as automobiles, carpets and electronics. Daily necessities are local-for-local – i.e. 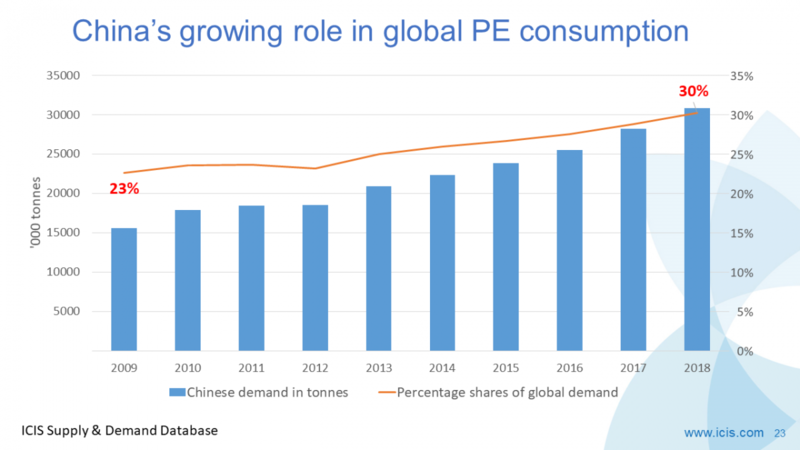 the final consumption of the majority of PE is in China itself. 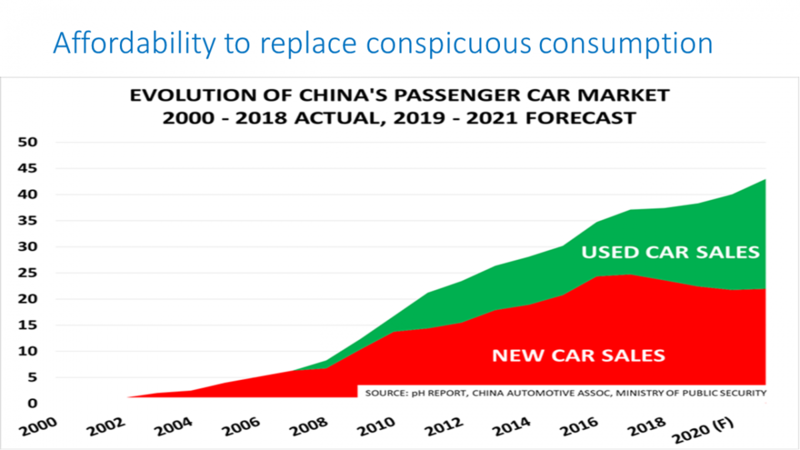 The higher levels of Chinese PP consumption relative to the US does not reflect more PP being consumed by individuals in China than in the US. It instead reflects that a lot of PP ends up in finished goods that are exported. To thus get a true measure of actual local PP consumption in China, headline per capita numbers should be adjusted to reflect the content of PP resins in finished goods that are exported. These numbers would then need to be subtracted from the headline PP per capita numbers to get an estimate of real per capita consumption. As with PE, you’d need to do this at a regional level. Some regions with very low per capita incomes would have very high nominal PP per capita consumption – probably way, way higher than the US – that would reflect their big export-focused manufacturing capacities. Adjusting these regions to real levels of PP per capita consumption therefore becomes especially important. Once per capita PP had been adjusted to reflect exports, you could then more accurately assess historic and future per capita demand. The export content of PP would also become a very useful separate set of historic numbers and estimates. Questions you would need to answer to predict export content would include this one: To what degree will China’s ageing population erode is status as the low cost workshop of the world? There are a range of scenarios here. China may suffer a demographics disaster where it completely fails to deal with the consequences of its One Child Policy. Between 2015 and 2040, China’s population aged 50 and over will increase by roughly 250m as the population under 50 falls by the same amount. During the same years the 15-29 age group – which across all modern societies has the highest education and is the most IT and tech savvy – will shrink by 75m. The only cohort that will grow in size will be the 50-64 age group and those over 64. In 2015-2020, the 65+ population will jump by almost 150% – from 135m to close to 340m. Or China may entirely succeed in dealing with its demographics problem, with any number of scenarios in between these two extremes. You would not only need to produce a wide range of scenarios for growth in the PP content in exports. Also required would be a wide range of outcomes for the composition of different grades of PP contained in the exports. 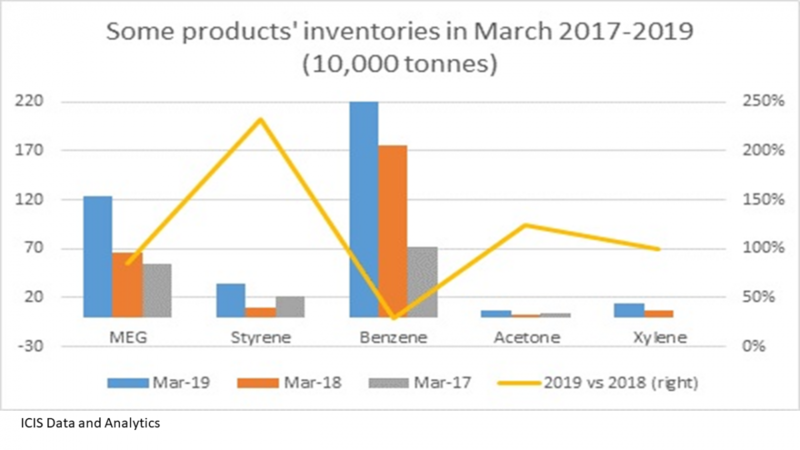 Complete success would see booming demand for higher value grades of PP, such as copolymer grades of PP, as China successfully moves up the manufacturing value chain as it escapes its middle-income trap. The other extreme of failure would mean much lower growth in demand for the higher value grades. This also circles back to the real, adjusted forecasts for growth in PP per capita consumption, minus export content. A demographic disaster would mean very disappointing local-for-local growth for PP, and also PE as well, of course, whereas complete success would mean strong growth in real per capita demand. 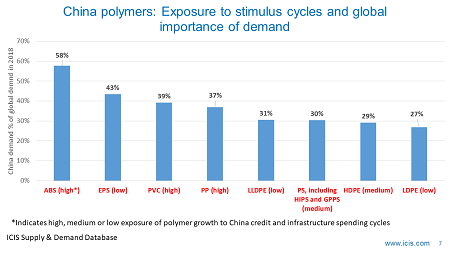 What applies to PP may apply to a greater extent to other polymers more heavily used in manufacturing durable goods. Acrylonitrile butadiene styrene (ABS) strikes me as a good example here. China accounted for no less than an estimated 58% of global ABS demand in 2018, with much of this demand driven by exports of finished goods. This isn’t easy and some of what is suggested above will at times at feel impossible. How, for example, do you get reliable data, region by region, of China’s exports? How do you accurately assess the content of PP resins in exports? But just because something is very difficult doesn’t mean you shouldn’t try. Our excellent team of analysts in China, backed up by the rest of our global team, are constantly searching for new and better ways of assessing demand. This includes both improved methodologies and deeper anecdotal understanding of what’s driving the markets. The anecdotal, when conclusive enough, can work its way into data. Watch this space as we develop deeper data and analytics on the China market.